The application is open until January 31, 2018. The origin of the baryon asymmetry of the universe is one of the main open questions in fundamental science. The solution to this puzzle requires physics Beyond the SM (BSM) that the LHC is probably sensitive to. A proper recasting and reinterpretation of the LHC Run-II results can thus provide crucial information about baryogenesis and its signatures in cosmological and intensity-frontier observables. The scientific program aims at making full use of the LHC data collected before the summer 2018 to scrutinize the baryogenesis mechanisms that rely on TeV-scale new physics. By imposing baryogenesis requirements and analyzing the Run-II data, we expect to obtain useful insights on the flavor structure and mass spectrum of the TeV-scale extension of the SM. These results, together with the estimates on the baryon asymmetry production developed in this program, will allow setting stringent lower bounds on the BSM CP-violation phases, with clear implications for the electric dipole moment experiments. Special attention will be dedicated to the strong first order phase transitions that TeV-scale baryogenesis mechanisms require. In a variety of models these transitions can also be responsible for an asymmetry in the dark matter sector, allowing for a TeV-scale dark matter candidate that eludes many of the present constraints. In dark matter scenarios with hidden sectors, moreover, the predictions on the phase transitions occurring in the dark sectors may be the only strategy to prove such theories. 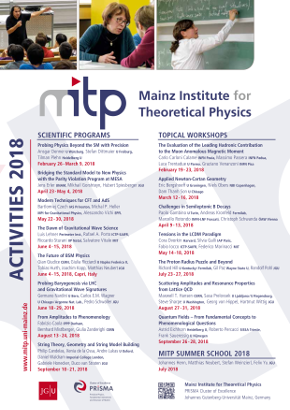 For these reasons, the lattice and perturbation-theory analyses on phase transitions that this scientific program will trigger are expected to become a breakthrough in the field. TeV-scale phase transitions are a hot topic nowadays also for a further reason: they can source gravitational waves in the frequency range testable at the Laser Interferometer Space Antenna (LISA). This proposal will help to identify the phase transitions, as well as further BSM sources of gravitational waves, that will turn to be favored by the Run-II data. Delivering this result to the LISA community in the summer 2018 is crucial. It will indeed allow the LISA community to react and optimize the LISA design to the expected BSM sources by the end of ESA phase A, after which no substantial change in the LISA instrument will be possible.